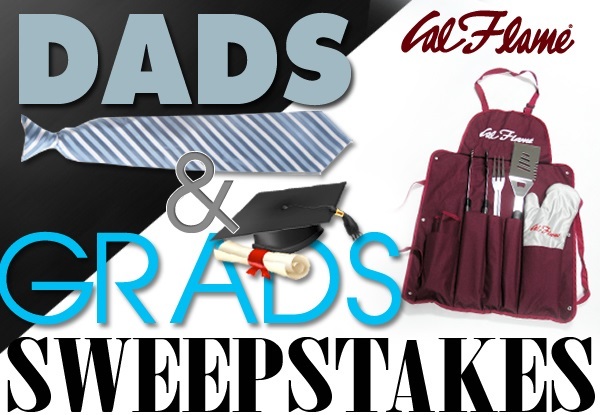 ENTER CAL FLAME’S DADS & GRADS SWEEPSTAKES TO WIN! Enter today! Visit the official Cal Flame BBQ Facebook fan page and enter the DADS & GRADS Sweepstakes. Complete and submit an entry form by Father’s Day, June 21st to win a Cal Flame Utensil Set with Apron and Glove! Three lucky winners will be selected. “LIKE” Cal Flame BBQ on Facebook. Click on the SWEEPSTAKES tab. Follow Cal Flame on Twitter and Instagram. Then, share your entry on your timeline with family and friends to increase your chances of winning! Contest begins May 19th, 2015 and ends on Father’s Day, Sunday, June 21, 2015 at 11:59 PM PST. Entries received after the deadline will not be eligible to win. Must be at least 18 years of age to enter. Sweepstakes only available to residents of the contiguous United States. Three (3) sweepstakes winners will be chosen randomly. Winners will be announced on or before Friday, June 26, 2015 via Facebook and contacted directly to collect prizes. Inability to contact a winner may result in disqualification and selection of an alternate winner. Valid email and phone number are required to enter. This promotion is in no way sponsored, endorsed or administered by, or associated with, Facebook. You are providing your information to Cal Spas/Cal Flame and not to Facebook. By participating in this promotion you agree to a complete release of Facebook from any claims. Participation in this promotion is subject to the official rules.